SoilBot is a rigorous and versatile substrate analyzer, it is another module that makes part of the GroLab™ family. It is capable to completely monitor the substrate of your plants regardless of whether it is soil, rock wool, coconut or a recurrent dipping of roots in water. Supports up to 4 moisture sensors giving you the possibility to monitor 4 different groups of plants at same time. When combined with PowerBot or TankBot allows you to automate their irrigation processes, keeping the perfect moisture for your plants avoiding water wasting and floods. SoilBot has also support for 2 temperature sensors allowing you a complete substrate analysis and 2 flood detectors that makes the system able to react/notify in case of flood detection. Take the control of your plants substrate with this versatile module! SoilBot has the ability to monitor any substrate's moisture regardless of whether it is soil, rock wool, coconut or a recurrent dipping of roots in water. 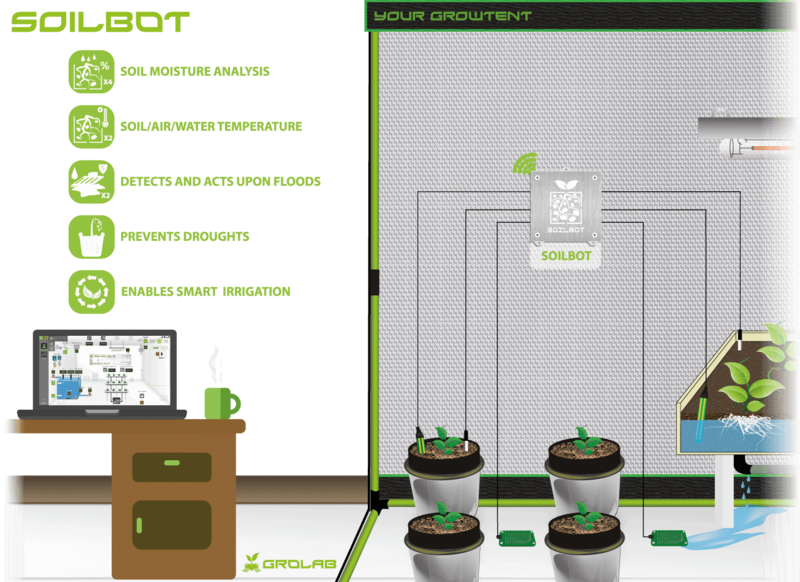 That's right SoilBot can also be used in a hydroponic set up! It supports up to 4 moisture sensors giving you the possibility to monitor 4 different groups of plants at same time. When combined with PowerBot or TankBot allows you to automate their irrigation processes, keeping the perfect moisture for your plants avoiding water wasting and floods. With this versatile module even the substrate temperature can be fully monitored. SoilBot supports 2 temperature sensors that greatly extends its substrate analysis capabilities. By combining SoilBot with PowerBot or Tankbot, it is possible to create procedures to keep substrate temperature at the perfect value for your plants to continue to grow healthier. Equipped with flood detection system, it will quickly detect water leaks, excess water and automatically activate the security features that the user has programmed to minimize damages and even notify you of any anomaly. SoilBot communicates with GroNode (the system's core module) through radio frequency with a range of 25 meters indoors (depending on obstacles) and 100 meters in open spaces. This makes it easy to install the SoilBot close to your plants. Using GroLab™ Software the user can monitor and analyze the different moisture, temperature and flood sensors in real time. The software provides you notifications, charts, grow(s) overview and even allows you to export the sensors values from the beginning of your grow(s) life cycle. When you provide Internet connection to GroNode (the system's core module) it can send real time alerts and updates to your e-mail about the state of the sensors connected to SoilBot. It will also notify you in case of any issues arises. Its design features a LED that indicates if the module is currently powered on and the connection state with GroNode (the system's core module). When connecting the GroNode (the system's core module) to a router with an Internet connection, it allows you to activate the GroLab™ system's remote control. This feature grants user access from anywhere at any time through an easy-to-use software. Allowing to fully control all the modules, including SoilBot.